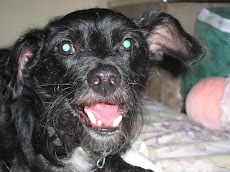 My dog says everyone who has a companion animal should know the following statistic: In six years, one female dog and her offspring can produce 67,000 dogs. In seven years, it's possible for one female cat and her offspring to produce approximately 420,000 cats. Yes, nearly half a million cats! What does that mean in the long run? Between six to eight million of those animals enter U.S shelters every year--and about half of them are killed. Today is Spay Day and spay/neuter clinics across the country are offering free or low cost altering to curb those births and subsequent deaths. What can you do to celebrate Spay Day? If your companion animal isn't fix, do it (besides, it protects them from a variety of cancers and diseases associated with the reproductive system)! If he or she is already altered, why not offer to pay to have someone else's animal fixed? Animals can't wear condoms, so do for them what they cannot do for themselves! P.S. This poster below is one of my favorites. 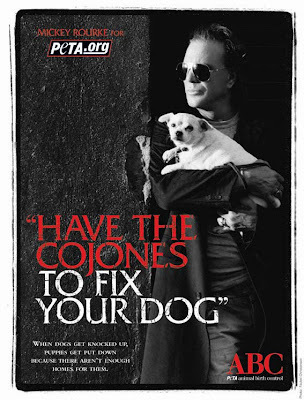 Mickey Rourke gets a double woof for speaking out in favor of spay/neuter!